Take up smoking – again! Sunday’s Secret Garden Club afternoon sees us return to the subject of smoking. Adding smoke to food gives it a delicious flavour and aroma, redolent of barbecues and the great outdoors. It doesn’t need specialist equipment: if you barbecue, you can smoke. 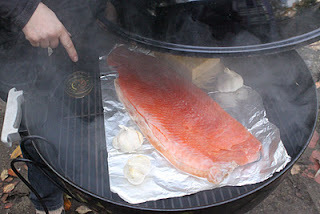 We’ll look at three different ways to smoke food – from delicate tea-smoked fish, to a range of vegetables hot-smoked over wood chips, to cold smoking and how to rig up a cold smoker in your own back garden for a very small outlay. MsMarmiteLover has promised to mix her acclaimed smoked lemon cocktails again to kick-start the afternoon, and we’ll finish with an afternoon tea inspired by our smoky ventures. There will be plenty of time to chat and discuss the best way to set up a smoker and various techniques and foods to try. 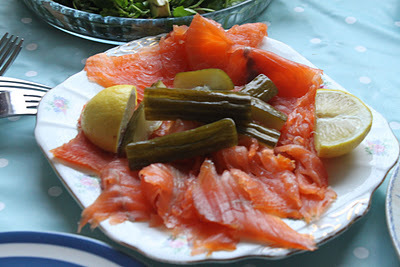 Trout fillets – smoked over leaves of Lapsang Souchong tea for a delicate, elusive taste. Join us on Sunday March 18th, starting at 2.00pm. Booking details are here. Previous Post: « Leeks! St. David’s Day.